I went to yoga this morning, dropped off two screaming boys at a friend's house so I could be alone for an hour, bending my body into unlikely positions and holding poses for longer than my tantruming muscles would have believed they could. I did an Enneagram test recently and it said I'm a 9. Nines have an unfortunate tendency to forget that our bodies and minds are connected. We forget to eat, we forget to exercise, we love to sleep but don't get enough of it. It was noteworthy to read that two months after starting a twice weekly yoga practice, and no wonder I've latched on to it so. My body has been something carrying me around, something birthing and nourishing babies, something I will to shuffle into a much despised jog. Doing yoga makes me feel alive in a way I can't put words to; I feel strong and healthy and almost like someone who doesn't forget that her body is not just a shell. It reminds me I'm more than the demands put upon me, I'm more than my usefulness and certainly more than my shortcomings. My ears tend to perk up when an inner change falls in step with an outward one. While I'm beginning to teach my lungs to breathe wide and slow, the air is cooler when I step out the door and neighbors have started putting pumpkins on stoops. I notice the changing season, and I take stock of my own heart while I'm at it. I'm reading Daring Greatly and studying Enneagram research and learning new things about myself at an age when I thought I was mostly done with all that. Autumn tumbles on and conversations turn soft and low between my husband and me. 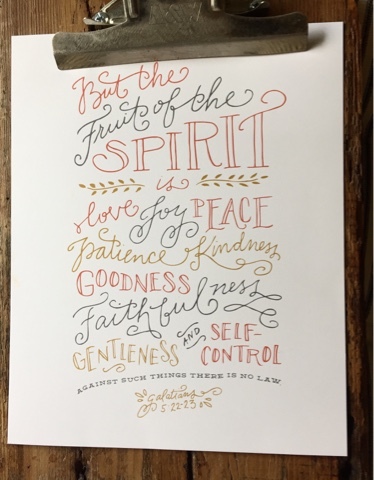 He wrestles and I discipline myself to listen, so familiar in our roles as 4 and 9. We'll be taking a trip together soon, with only our nonverbal child accompanying us, and the timing couldn't be better. The Holy Spirit seemed to blow in with Hurricane Matthew, and we're still trying to understand what it all means. But we've gotten good at our dance, ten years into it, and it's nice to know we'll still be holding hands as we look for the ground beneath us in thirty years too. Maybe by then I'll remember what it means to have a body. 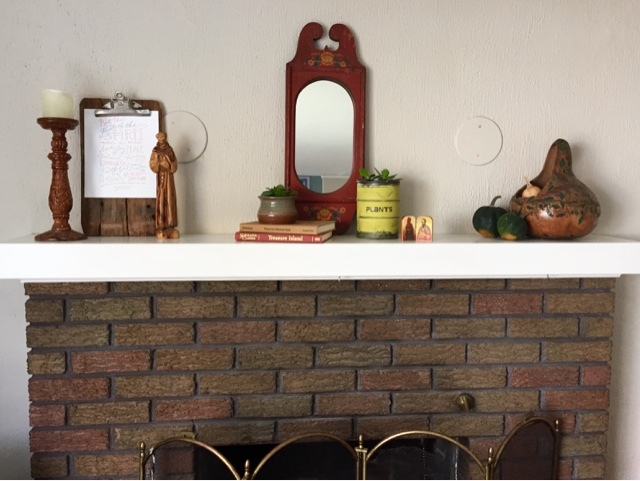 I usually change up our mantel with the seasons but I was slow on the draw this time around. A month ago I removed the bright, colorful knick knacks from summer but found I didn't know what to do with the deserted space as fall closed in. It just didn't seem time. 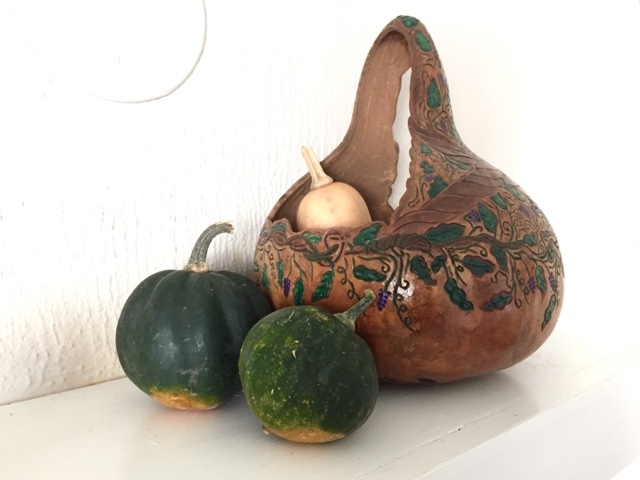 I halfheartedly put a few squash on it, trying out my harvest spirit, but it fell flat and they sat -awkward and lonely- for weeks. But I found my autumn. 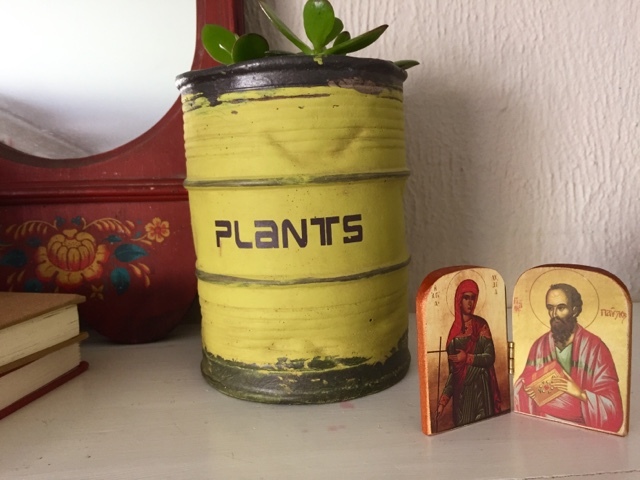 It came yesterday afternoon, hard and fast and unexpected, and found me scurrying to the basement (where I keep the quasi-seasonal junk I love) with a baby on my hip, pulling out random pieces of wooden and ceramic symbols of... something. 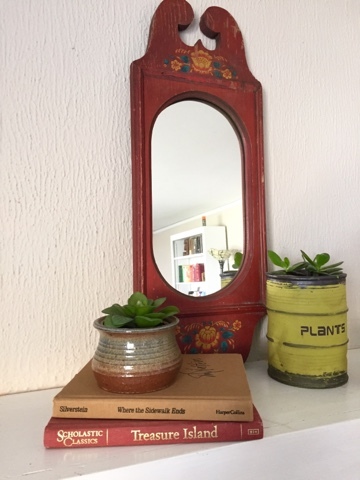 Succulents I'm trying not to kill (one is fake but I bet I could kill it anyway), children's books, a thrifted mirror, those damned squash. 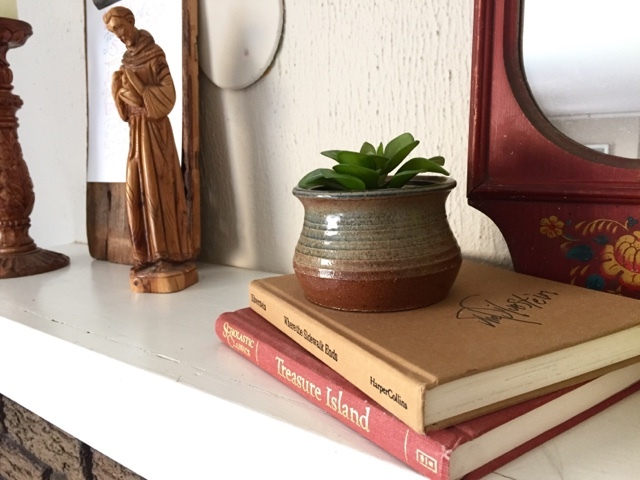 I hunted through the sunroom for more inspiration and came across St. Francis. There was no doubt in my mind he was due for some mantel time. Eric's been talking to him more and more lately, requesting some prayers if it's not too much to ask. And he's in heaven, after all, so it's probably not. Saints Paul and Lydia made the cut too, though my reasoning was less sure. They just felt right, like maybe we're needing a heaping dose from a few family members who were more certain about it all than we are. Lydia, wasn't she the one who sold purple cloth? Purple is a 4 color; maybe she gets my husband. Maybe I should start heckling her for some prayers. I'm drinking black coffee today and no one's more surprised about it than me. That sounds like it could be a metaphor for something but as far as I know, it's nothing. 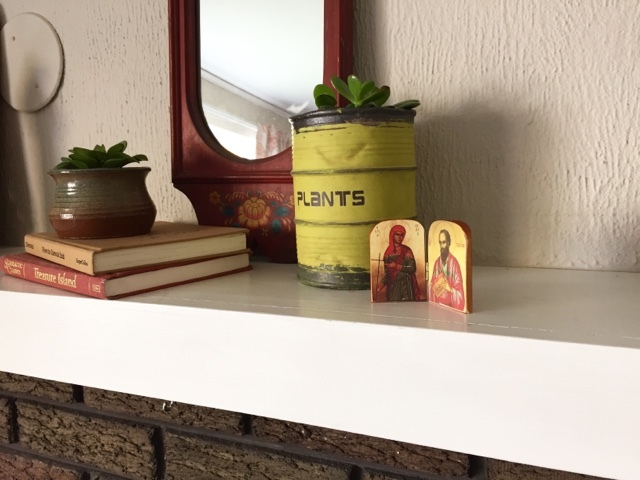 It's just black coffee and it's just finally autumn and I have dead but alive saints of God on my mantle.